Augustus Cole, a.k.a. Cole, a.k.a. "The Cole Train," is an adrenaline junkie and former professional Thrashball player who gave up his comfortable sports career to enlist in the COG army after his family was killed by Locust in Jannermont. He was actually one of the first to enlist after Emergence Day--just six days later. 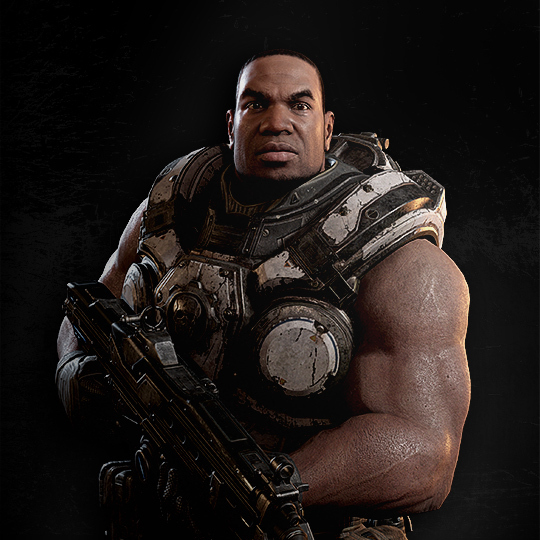 Cole has been a prominent character since Gears of War 1. Cole is charismatic, confident and enthusiastic about everything. He craves action and prefers to take the most direct path to the Locust Horde in any situation. What he lacks in finesse he makes up for in raw energy. He often uses his irrepressible good humour and optimism to cheer up his fellow Gears, especially when things get bleak. Even when the sheer brutality of the war gets to him or he misses his parents, Cole usually hides it in order to not affect morale. Along with his enthusiasm and charm, Cole is supremely confident in his ability to overcome anything, regardless of the odds, and he hasn't been proven wrong yet. His aggression against the Locust definitely hearkens back to his competitive sports background.